Luke gave an overview on the history of HTML5 vs. XHTML and the approaches of the W3C and the WHATWG. He explains how standards are produced and how this can be daunting. He then shows how “shipping code wins” and showcases lots of examples of new technology in action. He concludes with a nice comparison on how much simpler it is to build rich form interfaces with HTML5 and polyfills than with native code for various platforms. All in all a presentation very worth while from someone who is in the trenches and who is not afraid to use new technology and wait for the market to catch up. I won’t have time to watch it for a few days yet, but I can predict I’ll generally agree. HTML5+CSS3+CoffeeScript+jQuery makes for very easy UI-building, nothing beats it for whipping up custom widgets, and, MS-IE aside, it’s flat-out fun. …of course, there ARE still some things I doubt it’ll ever be able to do satisfactorily. …and command-line scripts in general, of course. It’s always important to have a good understanding of the limits of each and every one of your favorite tools. I stopped watching the slides when I read CSS 2D and 3D Transforms attached to WHATWG. 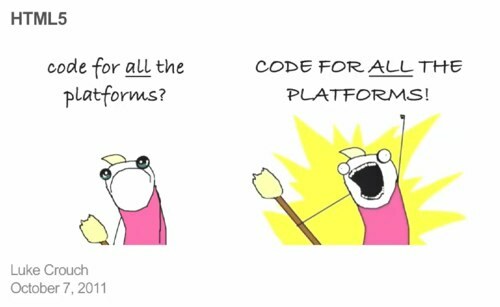 “Because shipping code wins”. Ah. Shipping code led to the a massive CSS Gradients mess, with 4 incompatible versions of gradients massively used in the wild. It currently leads to major problems in 2D and 3D Transforms and Animations, shipped and massively used before any stabilization. Hmm … as far as I could tell putting the presentation together, CSS animations were introduced by WHATWG members and finished together with W3C in 2008 when the groups started working together again. But I’m open to corrections – I wasn’t actively involved in either group at the time. I’m not a big CSS developer, but it sounds like CSS gradients and transforms have muddled thru that tension. The talk is/was directed at enterprise (mostly Microsoft) developers. The point of “shipping code wins” was to tell them not to wait on a vendor for Silverlight or Flash or any platform technology – go ship HTML5 code now.